A suite of exercise templates including all content and materials related to identifying, assessing, treating, managing, transporting and transferring high risk patients, which are fully customizable, approved by ASPR and the CDC, and based on the HSEEP model. These templates should be customized to meet each end user's requirements. The templates contain exercise content and material based on the HSEEP model and related to assessing, treating and managing Ebola virus disease and other special pathogen patients for Frontline Facilities, Assessment Hospitals, State-Designated Ebola Treatment Centers, Regional Ebola and Special Pathogen Treatment Centers & Regional Partners, and Health Care Coalitions. See the Beginners Guide to the right to get started or choose your templates below. This document is a guide for individuals who are new to exercise development and evaluation or those who need a refresher on exercise basics. 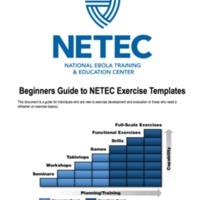 The NETEC Exercise Design Templates directly map to and support the ASPR Ebola Preparedness 2017 Hospital Preparedness Program Measurement Implementation Guidance.